Since its discovery in the beginning of the twentieth century by British archaeologist Arthur Evans, the Bronze Age (Minoan) civilization of Crete (Greece, ca. 3000–1200 B.C.) received considerable scholarly, scientific, and popular attention (e.g., Papadopoulos, 2005). Although subject to critique and revision (e.g., Hamilakis, 2002), Evans’s ideas and hypotheses about Minoan society remain remarkably central to modern archaeological research on the island (e.g., Schoep, 2010). The recognition of the disruptive effects of earthquakes on Minoan society represents one of Evans’s enduring legacies. Earthquakes have been considered as responsible for the successive destructions of the palace of Knossos (Evans, 1928) and as convenient time markers for Minoan archaeological periods (e.g., Driessen, 1987). Nowadays, they are often seen by Minoan archaeologists as an unattractive explanatory concept (Cadogan, 2011), at least when divorced from their wider social, political, and economic contexts (e.g., Driessen and Macdonald, 1997). Fear of catastrophism, undesirable use of deus ex machina phenomena, and resistance to Occam’s razor (lex parsimoniae) as a heuristic guide to archaeological explanation partly account for this situation. The ambiguous value of Minoan archaeological remains as indicators of ancient earthquakes may also have played a role: although damage typologies have been put forward in Greek archaeological contexts (Stiros, 1996), their applicability to Minoan earthen and rubble constructions is often limited. As a result, recognition of ancient earthquake damage on Minoan archaeological sites is frequently based on isolated observations (e.g., Sakellarakis and Sapouna-Sakellaraki, 1981; Vallianou, 1996; Monaco and Tortorici, 2004) and limited archaeological/palaeoenvironmental evidence (e.g., Gorokhovich, 2005), thereby perpetuating a catastrophist research tradition initiated by Evans more than a century ago. In the current context of increased scientific and scholarly interest in evaluating the role of archaeological data in seismotectonic studies, we feel that the time is ripe to critically evaluate the nature of Minoan archaeological data and assess their significance as indicators of ancient earthquakes. Getting to grips with the Minoan case may provide us with a new methodological basis for assessing the archaeoseismological potential of comparable archaeological stratigraphical contexts in the Eastern Mediterranean (Bronze Age Greece, Anatolia, Cyprus, and Levant) and in other parts of the world where cultural remains mainly consist of earthen and/or rubble constructions (e.g., Indus valley civilization and American Indian cultures). MINOAN DESTRUCTION LAYERS: A SEISMIC SMOKING GUN? In Minoan Crete (Evans, 1928), as elsewhere in the Eastern Mediterranean (Schaeffer, 1948), archaeological destruction layers, deposits, or horizons have been considered as evidence par excellence of catastrophic earthquake events. Destruction layers traditionally designate archaeological layers showing evidence for destruction caused by human and/or natural agents. Burned sediment, charcoal, collapsed architectural debris, smashed objects, and buried bodies are the most common archaeological criteria used to identify destruction deposits (Fig. 1). ▲Figure 1.Minoan archaeological destruction layers. (a) Malia, Block Nu: skeleton buried under collapsed architectural debris (photo courtesy of Ecole française d’Athènes, L9980.4); (b) Sissi: abandoned shrine with in situ ritual implements and crushed ceramic vessel (photo from F. Driessen-Gaignerot); (c) Sissi: smashed storage vases (photo from P. Zintzen). ▲ Figure 1. Minoan archaeological destruction layers. 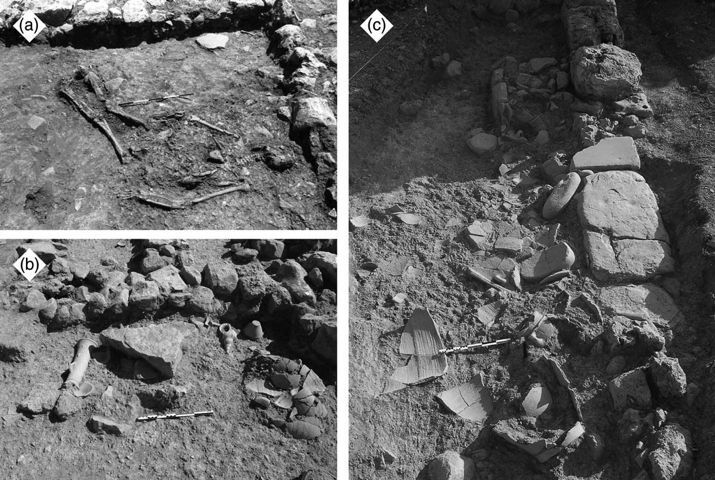 (a) Malia, Block Nu: skeleton buried under collapsed architectural debris (photo courtesy of Ecole française d’Athènes, L9980.4); (b) Sissi: abandoned shrine with in situ ritual implements and crushed ceramic vessel (photo from F. Driessen-Gaignerot); (c) Sissi: smashed storage vases (photo from P. Zintzen). The methodological drift might have gone unnoticed had Evans resisted giving stratigraphical value to earthquakes by associating all major destructions at Knossos with seismic events of varying intensities. The impact of Evans’s interpretive scheme can be gauged by mentioning the names of his intellectual heirs, including distinguished archaeologists Claude Schaeffer, discoverer of Ugarit-Ras Shamra, and Carl Blegen, excavator of Troy. In his Stratigraphie Comparée, Schaeffer (1948) correlated archaeological destruction layers throughout theMiddle East and ascribed them to catastrophic earthquakes. The violent destruction of Troy VI was likewise attributed by Blegen (1936) to a severe earthquake, hurling down the upper part of the city wall and House VI E. Later notable propagators of the seismic destruction hypothesis outside Crete include George Mylonas at Mycenae (Mylonas, 1966), Klaus Kilian at Tiryns (Kilian, 1996), and Aharon Kempinski at Meggido (Kempinski, 1989, following earlier views by Lamon and Shipton ). Drawing upon Schaeffer’s (1948) Stratigraphie Comparée, recent works by Nur and Cline (2000) and Nur and Burgess (2008) relate destruction evidence at Late Bronze Age settlements (including Knossos and Chania on Crete) all over the Eastern Mediterranean region ca. 1200 B.C. to an earthquake storm—the Late Bronze Age paroxysm. The time span of the earthquake storm, ca. 50 yr, explains chronological discrepancies between individual destructions and allows avoiding the trap of calling upon a single regional seismic event “beyond the limits of possible” (Ambraseys et al., 2002). In Minoan Crete, destruction layers at the palace of Phaistos (La Rosa, 1995), at the temple of Anemospilia (Sakellarakis and Sapouna-Sakellaraki, 1981), and at the villa of Pitsidia (Vallianou, 1996) were documented and somewhat indiscriminately ascribed to catastrophic earthquakes. Examination of the disruptive effects of earthquakes on Minoan architectural remains is comparatively more recent. However, focus on prestigious, and hence exceptional, constructions such as villas and palaces is prone to circular reasoning, with isolated architectural damage being used to support earthquake hypotheses put forward by archaeologists and with earthquake hypotheses put forward by archaeologists being used to validate the seismic origin of isolated architectural damage (La Rosa, 1995; Monaco and Tortorici, 2004). The characteristic disregard surrounding formation processes of Minoan destruction deposits (Warren, 1991; Driessen and Macdonald, 1997; Knappett and Cunningham, 2003; Cunningham, 2007; Whitelaw, 2007; Bruins et al., 2008; Driessen and MacGillivray, 2011, for notable exceptions) betrays, we suspect, an urgent need to develop an archaeologically grounded basis for assessing the material effects of earthquakes on Minoan stratigraphical records in the light of newly available palaeoseismological data (Caputo et al., 2006, 2010). ▲Figure 2. Simplified seismotectonic map of Crete, modified after Caputo et al. (2010), with main archaeological sites and active normal faults discussed in the text. Background map is courtesy of Laboratory of Geophysical-Satellite Remote Sensing & Archaeo-environment (IMS-FORTH, Rethymno). Inset: location of Crete within the geodynamic framework of the Eastern Mediterranean (modified after Stiros ). GrF, Gramvousa fault; RFZ, Rodopos fault zone; PAGF, Paleochora–Agia Roumeli fault; SfF, Sfakia fault; AF, Asomatos fault; SpF, Spili fault; AGF, Agia Galini fault; EPFZ, Eastern Psiloritis fault zone; KF, Kastelli fault; IFZ, Ierapetra fault zone; SFZ, Siteia fault zone; MF, Messara fault; MrF, Mirto fault. ▲ Figure 2. Simplified seismotectonic map of Crete, modified after Caputo et al. (2010), with main archaeological sites and active normal faults discussed in the text. Background map is courtesy of Laboratory of Geophysical-Satellite Remote Sensing & Archaeo-environment (IMS-FORTH, Rethymno). Inset: location of Crete within the geodynamic framework of the Eastern Mediterranean (modified after Stiros ). GrF, Gramvousa fault; RFZ, Rodopos fault zone; PAGF, Paleochora–Agia Roumeli fault; SfF, Sfakia fault; AF, Asomatos fault; SpF, Spili fault; AGF, Agia Galini fault; EPFZ, Eastern Psiloritis fault zone; KF, Kastelli fault; IFZ, Ierapetra fault zone; SFZ, Siteia fault zone; MF, Messara fault; MrF, Mirto fault. Pi = 1 − P(0). Application of equation (3) to the 21 active fault segments identified in Crete (Caputo et al., 2010) (Table 1) with t = 100 yr gives P = 0:998. Hence the probability of observing at least one earthquake of magnitude superior or equal to 6.0 during any period of 100 yr is nearly 1. This number is even conservative because earthquakes not associated with surface rupture are excluded. Active faults segments omitted by Caputo et al. (2010) (e.g., Archanes fault in the Irakleio Basin; Wiatr et al., 2011) or for which no seismotectonic parameters are available (Agia Galini fault in southern Crete) also suggest a minimum result. The calculated probability, echoing Evans’s (1928) observation that “during the last five centuries, of which we have some historic record, the Candia [modern Irakleio] district has been stricken…by two serious earthquakes in every hundred years” (p. 315), has significant implications for the study of the formative processes of the archaeological record in Crete (Schiffer, 1987). Particularly, it suggests that earthquakes may have a more significant impact than previously thought on the burial and preservation of archaeological remains, irrespective of the cultural period considered. Although it is acknowledged that the random-time-distribution model of seismic events in Crete might not be entirely appropriate due to the grouping of earthquakes into temporal clusters of events (Papazachos, 1992; Papazachos and Papaioannou, 1993), this problem may be minimized by considering only main shocks (Kagan and Jackson, 1991; Corral, 2004; Molchan, 2005), those perhaps most prone to be recorded archaeologically. The location of the fault zones and the main fault segments is shown in Figure 2. M, most likely magnitude; RI, mean recurrence interval for the last 13 ka; r, average rate of earthquake occurrence; Pi(t = 100), probability of observing at least one earthquake during t = 100 yr.
During the last decades, much effort has been made to identify reliable criteria for the detection of seismic damage from archaeological remains. This traditional approach to the study of past earthquakes is mainly based on the definition of damage typologies from monumental architectural evidence (e.g., Stiros, 1996; Marco, 2008; Rodríguez-Pascua et al., 2011). In Minoan Crete, as in other Eastern Mediterranean cultures, stratigraphy often constitutes the best source of evidence for identifying seismic effects on archaeological sites. In such cases, an evaluation of the processes that led to the formation of destruction layers (collapse, abandonment, clearance, fire, etc. ), along with a territorial approach testing evidence of a synchronous event in a certain region (Galadini et al., 2006; Sintubin and Stewart, 2008), is necessary. In prehistoric contexts such as Minoan Crete, synchronicity of archaeological events can at best be resolved within the analytical limits imposed by radiocarbon chronology, typically with inbuilt uncertainty at 2 standard deviations of ca. 150– 200 yr. Although more widespread application of Bayesian statistical frameworks might improve the situation (Finkelstein and Piasetzky, 2009), progress is unlikely to be made until Minoan destruction layers are systematically radiocarbon dated. This, of course, does not solve the problem of how to derive meaningful information from the massive amounts of archaeological data collected since the advent of Minoan archaeology early in the twentieth century. Changes in ceramic styles often represent the only evidence upon which (relative) chronological frameworks are established, and this observation means that focusing on periods of rapid ceramic change should reduce the possibility of amalgamating the effects of several destructive events into “seismological monsters” (Guidoboni, 2002). From a taphonomic perspective, rapid changes in material culture might be suggestive of a period of stress (Driessen, 1995) potentially involving the interplay of several destructive factors. As a result, physical effects of seismic events can become obscured or magnified (e.g., Galadini et al., 2006; Sintubin et al., 2008). During periods of social instability, abandonment or lack of maintenance increases the vulnerability of buildings to mechanical stress. As a result, “earthquake effects that would otherwise have been little noted in history are instead left extant” (Sintubin et al., 2008, p. 768). We suggest that this potential observation bias may hold the key to a better understanding of the physical effects of earthquakes on Minoan constructions and stratigraphical records. In this perspective, well-documented periods of social upheaval, destructions, abandonments, and rapid ceramic change such as Late Minoan IA (LM IA, 1700/1675–1625/1600 B.C. ), Late Minoan IB (LM IB, 1625/1600–1470/1460 B.C. ), and Late Minoan IIIB (LM IIIB, 1330/1315–1200/1190 B.C.) (Manning, 2010, p. 23, table 2.2) may represent useful methodological starting points and provide unique opportunities for studying minimally disturbed records of earthquake damage. In agreement with the previously suggested random time distribution of earthquakes, these ca. 100-yr time windows can moreover be assumed to have witnessed at least one seismic event of magnitude superior or equal to 6.0, which may have left an imprint on nearby settlements. The adoption of such a framework will, however, require reconsidering the role of archaeoseismology as potential contributor to seismotectonic studies: archaeological visibility of earthquakes may indeed be more related to social factors than to physical parameters. In our opinion, this prospect is liberating because it may reveal the true uniqueness of archaeoseismology— dealing with material data inescapably resulting from the interaction of natural and cultural processes. Archaeoseismology as a discipline may therefore be particularly well placed to identify the factors, cultural or natural, ultimately controlling the archaeological recording and preservation of ancient earthquake effects. Examining why and how these effects are made, erased, lived in, or recycled can tell us much about past societies and their attitude toward ruins and natural disasters (Dawdy, 2010). Where Minoan Crete is concerned, it must be stressed that little is known of the kind of stratigraphy that should be expected from Minoan relief and recovery efforts such as street clearing, ruin consolidation or demolition, recovery of human victims, and material recycling (Macdonald, 2001). Likewise, it remains unclear how these operations might have been influenced by the ability of particular households, communities, or regions to mobilize a sufficient labor force. For these reasons, we feel that it is time to move beyond generalizing models of “seismic cultures,” which establish simple links between earthquake frequency and human adaptation (Poursoulis et al., 2000). Taking up this challenge will require reconsidering the Minoan data set on a case-by-case basis, starting with higher- visibility windows such as LM IA, LM IB, or LM IIIB. It is clear that sudden collapses and destructions may be due to nonseismic causes and may have occurred within an archaeological time span of several decades (Galadini and Galli, 2004). Although some might view this issue as unchallengeable and perhaps even sufficient for questioning altogether the methodological grounds of archaeoseismology, we prefer to see it as an avenue for developing specific scenarios of earthquake damage which further research might eventually reject or validate. The representation obtained may not be good enough for a disaster story, but it certainly brings us closer to a satisfactory account of interpretive uncertainties associated with the use of Minoan archaeological data in any attempt to reconstruct the ancient earthquake history of the island. We thank SRL editor J. E. Ebel for suggestions that helped improve this article. We are grateful to A. Farnoux and J. Driessen for allowing the reproduction of Figure 1a. A. Sarris kindly allowed us to reproduce the background map presented in Figure 2. S. J. is a postdoctoral researcher of the Fonds de la Recherche Scientifique-FNRS, Belgium. Currently, S. J. is an intercommunity scientific postdoctoral collaborator of the Francqui Foundation at the KU Leuven. This article is a contribution to the International Geoscience Programme IGCP 567 Earthquake Archaeology. Ambraseys, N. N., J. A. Jackson, and C. P. Melville (2002). Historical seismicity and tectonics: The case of the Eastern Mediterranean and the Middle East, in International Handbook of Earthquake and Engineering Seismology. Part A, W. H. K. Lee, H. Kanamori, P. C. Jennings, and C. Kisslinger (Editors), Int. Geophys. 81A, Academic Press, Amsterdam, 747–763. Angelier, J. (1979). Néotectonique de l’Arc Égéen, Société Géologique du Nord 3, Société Géologique du Nord, Villeneuve-d’Ascq, France, 417 pp. Armijo, R., H. Lyon-Caen, and D. Papanastassiou (1991). A possible normal- fault rupture for the 464 BC Sparta earthquake, Nature 351, 137–139. Armijo, R., H. Lyon-Caen, and D. Papanastassiou (1992). East–west extension and Holocene normal-fault scarps in the Hellenic arc, Geology 20, 491–494. Benedetti, L., R. Finkel, D. Papanastassiou, G. King, R. Armijo, F. Ryerson, D. Farber, and F. Flerit (2002). Post-glacial slip history of the Sparta fault (Greece) determined by 36Cl cosmogenic dating: Evidence for non-periodic earthquakes, Geophys. Res. Lett. 29, 87-1–87-4. Blegen, C. W. (1936). Excavations at Troy, 1936, Am. J. Archaeol. 41, 17–51. Bruins, H. J., J. A. MacGillivray, C. E. Synolakis, C. Benjamini, J. Keller, H. J. Kisch, A. Klügel, and J. van der Plicht (2008). Geoarchaeological tsunami deposits at Palaikastro (Crete) and the Late Minoan IA eruption of Santorini, J. Archaeol. Sci. 35, 191–212. Cadogan, G. (2011). Are there any patterns? The destructions, disasters, desertions, foundations and resettlements of Bronze Age Crete, Presented at the 11th Cretological Congress, Rethymno, Crete, Greece, October 2011. Caputo, R., S. Catalano, C. Monaco, G. Romagnoli, G. Tortorici, and L. Tortorici (2010). Active faulting on the island of Crete (Greece), Geophys. J. Int. 183, 111–126. Caputo, R., C. Monaco, and L. Tortorici (2006). Multiseismic cycle deformation rates from Holocene normal fault scarps on Crete (Greece), Terra Nova 18, 181–190. Corral, A. (2004). Long-term clustering, scaling, and universality in the temporal occurrence of earthquakes, Phys. Rev. Lett. 92, 108501.1–108501.4. Cunningham, T. (2007). Havoc: The destruction of power and the power of destruction in Minoan Crete, in Power and Architecture: Monumental Public Architecture in the Bronze Age Near East and Aegean, J. Bretschneider, J. Driessen, and K. Van Lerberghe (Editors), Orientalia Lovaniensia Analecta 156, Peters Publishers, Leuven, 23–43. Dawdy, S. L. (2010). Clockpunk anthropology and the ruins of modernity, Curr. Anthropol. 51, 761–793. Dionysiou, D. D., and G. A. Papadopoulos (1991). Poissonian and negative binomial modelling of earthquake time series in the Aegean area, Phys. Earth Planet. In. 71, 154–165. Driessen, J. M. (1987). Earthquake-resistant construction and the wrath of the “Earth-Shaker”, J. Soc. Archit. Hist. 46, 171–178. Driessen, J. (1995). “Crisis architecture”? Some observations on architectural adaptations as immediate responses to changing socio-cultural conditions, Topoi 5, 63–88. Driessen, J., and C. F. Macdonald (1997). The Troubled Island. Minoan Crete Before and After the Santorini Eruption, Aegaeum 17, Université de Liège, The University of Texas at Austin, Liège, Austin, 284 pp. Driessen, J., and J. A. MacGillivray (2011). Swept away in LM IA? Explaining debris deposition in coastal Neopalatial Crete, Πεπραγ- μένα Ι’ Διεθνούς Κρητολογικού Συνεδρίου (Χανιά 1–8 Οκτοβρίου 2006) A1, 259–270. Evans, A. J. (1928). The Palace of Minos: A Comparative Account of the Successive Stages of the Early Cretan Civilization as Illustrated by the Discoveries at Knossos, Part I: Fresh Lights on Origins and External Relations: The Restoration in Town and Palace after Seismic Catastrophe towards Close of M. M. III, and the Beginnings of the New Era, Vol. 2, Macmillan and Co., London, 390 pp. Finkelstein, I., and E. Piasetzky (2009). Radiocarbon-dated destruction layers: A skeleton for Iron Age chronology in the Levant, Oxf. J. Archaeol. 28, 255–274. Galadini, F., and P. Galli (2004). The 346 A.D. earthquake (centralsouthern Italy): An archaeoseismological approach, Ann. Geophys. 47, 885–905. Galadini, F., K.-G. Hinzen, and S. Stiros (2006). Archaeoseismology: Methodological issues and procedure, J. Seismol. 10, 395–414. Gorokhovich, Y. (2005). 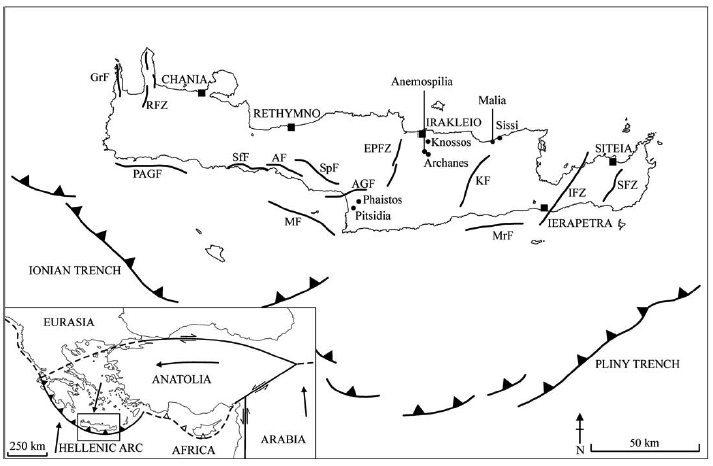 Abandonment of Minoan palaces on Crete in relation to the earthquake induced changes in groundwater supply, J. Archaeol. Sci. 32, 217–222. Guidoboni, E. (2002). Historical seismology: The long memory of the inhabited world, in International Handbook of Earthquake and Engineering Seismology, Part A, W. H. K. Lee, H. Kanamori, P. C. Jennings, and C. Kisslinger (Editors), Int. Geophys. 81A, Academic Press, Amsterdam, 775–790. Hamilakis, Y. (Editor) (2002). Labyrinth Revisited: Rethinking ‘Minoan’ Archaeology, Oxbow Books, Oxford, 237 pp. Kagan,Y. Y., and D. D. Jackson (1991). Long-term earthquake clustering, Geophys. J. Int. 104, 117–133. Kempinski, A. (1989). Megiddo: A City State and Royal Centre in North Israel, C.H. Beck, Munich, 262 pp. Kilian, K. (1996). Earthquakes and archaeological context at 13th century BC Tiryns, in Archaeoseismology, S. Stiros and R. E. Jones (Editors), British School at Athens Fitch Laboratory Occasional Paper 7, Institute of Geology and Mineral Exploration, The British School at Athens, Athens, 63–68. Knappett, C., and T. F. Cunningham (2003). Three Neopalatial deposits from Palaikastro, East Crete, Ann. Br. Sch. Athens 98, 107–187. Lamon, R. S., and G. M. Shipton (1939). Megiddo I. Seasons of 1925–34, Strata I–V, Oriental Institute Publications 42, University of Chicago Press, Chicago, 235 pp. La Rosa, V. (1995). A hypothesis on earthquakes and political power in Minoan Crete, Ann. Geofisc. 38, 881–891. Macdonald, C. (2001). Defining earthquakes and identifying their consequences in north central Crete during the Old and New Palace periods, Presented at the 9th Cretological Congress, Elounda, Crete, Greece, October 2001. Manning, S. W. (2010). Chronology and terminology, in The Oxford Handbook of the Bronze Age Aegean, E. H. Cline (Editor), Oxford University Press, New York, 11–28. Marco, S. (2008). Recognition of earthquake-related damage in archaeological sites: Examples from the Dead Sea fault zone, Tectonophysics 453, 148–156. Molchan, G. (2005). Interevent time distribution in seismicity: A theoretical approach, Pure Appl. Geophys. 162, 1135–1150. Monaco, C., and L. Tortorici (2004). 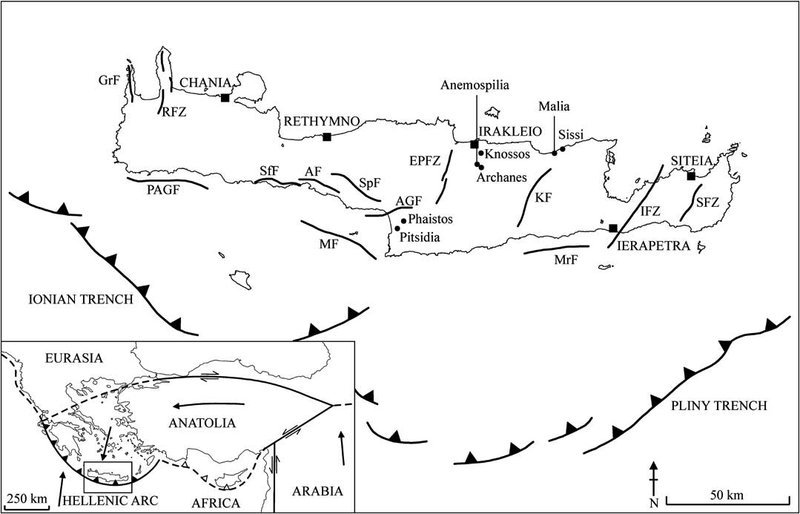 Faulting and effects of earthquakes on Minoan archaeological sites in Crete (Greece), Tectonophysics 382, 103–116. Mouslopoulou, V., D. Moraetis, and C. Fassoulas (2011). Identifying past earthquakes on carbonate faults: Advances and limitations of the ‘rare earth element’ method based on analysis of the Spili fault, Crete, Greece, Earth Planet. Sci. Lett. 309, 45–55. Mylonas, G. E. (1966). Mycenae and the Mycenaean Age, Princeton University Press, Princeton, 251 pp. Nur, A., and D. Burgess (2008). Apocalypse: Earthquakes, Archaeology, and the Wrath of God, Princeton University Press, Princeton, 309 pp. Nur, A., and E. H. Cline (2000). Poseidon’s horses: Plate tectonics and earthquake storms in the Late Bronze Age Aegean and Eastern Mediterranean, J. Archaeol. Sci. 27, 43–63. Papadopoulos, G. A. (1996). An earthquake engineering approach to the collapse of theMycenaean palace civilization of the Greek mainland, in Archaeoseismology, S. Stiros and R. E. Jones (Editors), British School at Athens Fitch Laboratory Occasional Paper 7, Institute of Geology and Mineral Exploration, The British School at Athens, Athens, 205–209. Papadopoulos, J. K. (2005). Inventing the Minoans: Archaeology, modernity and the quest for European identity, J. Mediterr. Archaeol. 18, 87–149. Papadopoulos, G. A. (2011). A Seismic History of Crete: The Hellenic Arc and Trench, Ocelotos, Athens, 415 pp. Papazachos, B. C. (1992). A time- and magnitude-predictable model for generation of shallow earthquakes in the Aegean area, Pure Appl. Geophys. 138, 287–308. Papazachos, B. C., and C. A. Papaioannou (1993). Long-term earthquake prediction in the Aegean area based on a time and magnitude predictable model, Pure Appl. Geophys. 140, 593–612. Papazachos, B., and C. Papazachou (1997). The Earthquakes of Greece, Ziti, Thessaloniki, 304 pp. Poursoulis, G., R. Dalongeville, and B. Helly (2000). Destruction des édifices minoens et sismicité récurrente en Crète (Grèce), Géomorphol. Relief Process. Environ. 4, 253–266. Rodríguez-Pascua, M. A., R. Pérez-López, J. L. Giner-Robles, P. G. Silva, V. H. Garduño-Monroy, and K. Reicherter (2011). A comprehensive classification of earthquake archaeological effects (EAE) in archaeoseismology: Application to ancient remains of Roman and Mesoamerican cultures, Quat. Int. 242, 20–30. Sakellarakis, Y., and E. Sapouna-Sakellaraki (1981). Drama of death in a Minoan temple, Natl. Geogr. 169, 204–222. Schaeffer, C. F. A. (1948). Stratigraphie Comparée et Chronologie de l’Asie Occidentale (IIIe et IIe Millénaires), Oxford University Press, London, 653 pp. Schiffer, M. B. (1987). Formation Processes of the Archaeological Record, University of Utah Press, Salt Lake City, 428 pp. Schoep, I. (2010). The Minoan ‘palace-temple’ reconsidered: A critical assessment of the spatial concentration of political, religious and economic power in Bronze Age Crete, J. Mediterr. Archaeol. 23, 219–243. Sintubin, M., and I. S. Stewart (2008). A logical methodology for archaeoseismology: A proof of concept at the archaeological site of Sagalassos, southwest Turkey, Bull. Seismol. Soc. Am. 98, 2209–2230. Sintubin, M., I. S. Stewart, T. Niemi, and E. Altunel (2008). Earthquake archaeology—Just a good story? Seismol. Res. Lett. 79, 767–768. Stewart, I. S., and P. L. Hancock (1991). Scales of structural heterogeneity within neotectonic normal fault zones in the Aegean region, J. Struct. Geol. 13, 191–204. Stiros, S. C. (1996). Identification of earthquakes from archaeological data: Methodology, criteria and limitations, in Archaeoseismology, Stiros, S., and R. E. Jones (Editors), British School at Athens Fitch Laboratory Occasional Paper 7, Institute of Geology and Mineral Exploration, The British School at Athens, Athens, 129–152. Stiros, S. C. (2009). Earthquakes, in The Physical Geography of the Mediterranean, J. C. Woodward (Editor), Oxford University Press, Oxford, 469–491. Vallianou, D. (1996). New evidence of earthquake destructions in Late Minoan Crete, in Archaeoseismology, Stiros, S., and R. E. Jones (Editor), British School at Athens Fitch Laboratory Occasional Paper 7, Institute of Geology and Mineral Exploration, The British School at Athens, Athens, 153–167. Warren, P. M. (1991). A new Minoan deposit from Knossos, c. 1600 B.C., and its wider relations, Annu. Br. Sch. Athens 86, 319–340. Whitelaw, T. (2007). House, households and community at Early Minoan Fournou Korifi: Methods and models for interpretation, in Building Communities: House, Settlement and Society in the Aegean and Beyond, R. Westgate, N. Fisher, and J. Whitley (Editors), British School at Athens Studies 15, The British School at Athens, London, 65–76. Wiatr, T., I. D. Papanikolaou, K. Reicherter, and T. Fernández-Steeger (2011). A terrestrial close range view of the normal fault zone near Archanes (East Yiouchtas Mt., Heraklion Basin, Crete), Presented at the 2nd INQUA-IGCP-567 International Workshop on Active Tectonics, Earthquake Geology, Archaeology and Engineering, Corinth, Greece, September 2011. 1. P. Popham, The Independent, 1 August 2004. 2. Currently known as the 26 June 1926 event, an intermediate-depth earthquake of magnitude 7.4 with its epicenter off the island of Kos, some 200 km northeast of Knossos (Papadopoulos, 2011).